If you child was killed or injured after getting trapped inside a hope chest, contact Carr & Carr Attorneys to see if we can help your family. Hope chests can be a deadly hiding place for young children who don’t realize that they may become trapped inside them. The wooden boxes, used for storage and holding family heirlooms, seem like the perfect spot for a child to hide during a game of hide-and-seek. But children don’t know that some latches, especially those on older chests, can be opened from only the outside, potentially locking inside any child that climbs in and closes the lid. In fact, this exact tragedy happened in January of 2014 to a family in Franklin, Massachusetts. A brother and sister under the age of 10 apparently got trapped inside a hope chest and suffocated. The children were not able to escape the hope chest after the lid closed. Between 1977 and 1994, six children suffocated inside Lane cedar chests manufactured with an unsafe lock design. The children ranged in age from 21 months to ten years old. In 1996, after receiving reports that six children died in hope chests, Lane Furniture recalled 12 million cedar chests with lids which automatically latch shut. These cedar chests latch shut without having to depress a button. 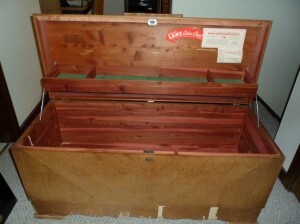 The massive recall covered all Lane and Virginia Maid brand cedar chests manufactured between 1912 and 1987. According the the Consumer Product Safety Commission, all Lane and Virginia Maid brand cedar chests in the recall need to have their locks replaced. The chests are often handed down through families, and it is likely that many were purchased second-hand. Lane is offering a replacement lock which will prevent entrapment because they do not automatically latch shut when the lid is closed. Carr & Carr’s caring lawyers help families who have suffered the tragic loss of a child. We are experienced in assisting families who have endured this heartbreaking loss. We work with families across the United States. If your family has been a victim of a defective product injury, please call us at 1-877-392-4878 or email us to see if we can help your family.